Tea Filter Basket by La Cafetiere. Great for serious tea drinkers with loads of space for the leaf to infuse. 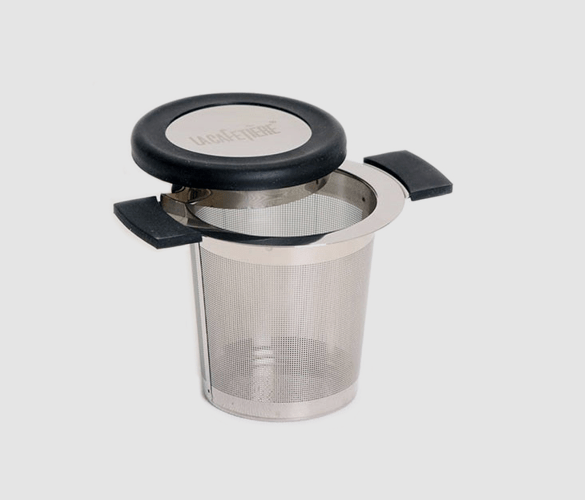 This stainless steel La Cafetiere filter basket is perfect for infusing loose leaf tea. It couldn’t be easier to create a fresh cup of tea, simply add into the basket with hot water, infuse and enjoy! The La Cafetiere filter basket would make the perfect gift for the tea lover in your life. Nothing really does compare to fresh loose leaf, and it is an easy way to improve your brewing. Many think loose leaf is more complicated than tea bags, but this product takes away all the complications and makes it easy for everyone to enjoy a fresh brew. Anyone who has a passion for tea would be thrilled to receive this as a gift, and you can even pair it with some bags of premium loose leaf to create your own hamper. If you need advice on which products to try, take a look at our guide to loose leaf tea. At Adams + Russell we strive to make brewing much simpler, so that everyone can enjoy a fresh and delicious brew. That is why we provide easy to use products that makes tea and coffee brewing accessible to all. Put the kettle on with fresh water. Grab your favourite mug and make sure it is clean. Place the filter basket into your mug and remove the lid. We recommend one heaped scoop per person. So, for one mug, add in one scoop of loose leaf into the basket. Pour the freshly boiled water over the leaves and fill to the top. Depending on what type of tea you’re using will depend on the brew time. Black loose leaf usually needs around 1 – 2 minutes, whereas a herbal infusion could need up to 5 minutes. The recommended amount of time should be stated on the bag. Make sure to place the lid on the basket whilst brewing to retain the heat. Once brewed, slowly remove the basket from the mug using the rubber handles. Don’t touch the metal as this will be very hot. Sip and enjoy your fresh and delicious brew! La Cafetiere has been creating innovative brewing devices for over 50 years. They are experts in combining traditional methods with modern designs to create products that stand out from the competition. Style and design play a huge role in their collections, as well as practicality and durability. We are proud to supply the premium products that this brand has to offer.